The attractive village of Braughing has long been famous for its locally made pork sausages, but it is also well known for its traditions, one of the most notable being that of Old Man’s Day. Every year, on 2 October, the residents of the village gather to commemorate an extraordinary event that occurred in 1571 – or, to be more precise, an event that didn’t occur! It concerns the tale of one Matthew Wall, a young farmer in his prime who was engaged to be married to his sweetheart. The ceremony that took place on 2 October 1571 was not his marriage, however, but his funeral. As the pallbearers carried his coffin down Fleece Lane, which is steep in places, on the way to the church of St Mary the Virgin in the village, one of them slipped on the wet autumn leaves that covered the lane and, to everyone’s horror, the coffin fell to the ground. But the shock, and no doubt embarrassment, of the pallbearers quickly turned to amazement as they suddenly heard a loud banging and cries coming from inside the coffin. On opening the lid they discovered that Matthew was still very much alive! It is likely that he had been in a coma, or had suffered some kind of fit, and the jolt of the coffin as it hit the ground had brought him back to consciousness. A lucky escape indeed! After recovering from this ordeal, Matthew did eventually marry his sweetheart and they had two sons. He lived for many more years, until 1595, and when he did finally die he made a rather unusual bequest in his will. He left some of this money (which amounted to 20 shillings in total) specifically so that every year on 2 October the church bells would be tolled as if for a funeral and then later rung in a wedding peal. Some of the money also paid for the sexton to place brambles on his grave to prevent sheep grazing on it – a custom known as brambling. And lastly, he requested that Fleece Lane should be swept clear of leaves to ensure that no-one slipped on them – a rather strange request, in fact, given that had there been no slippery leaves covering the lane on the day of his ‘funeral’ in 1571 he might well have been buried alive! The tradition is still kept alive today and on Old Man’s Day each year the church bells are rung as Matthew requested, local children and the vicar sweep Fleece Lane with brooms – the children being rewarded for their efforts with sweets – prayers are said by Matthew’s grave and a song is sung to commemorate his lucky escape. This page was added on 03/01/2018. Lovely story about matthew wall. 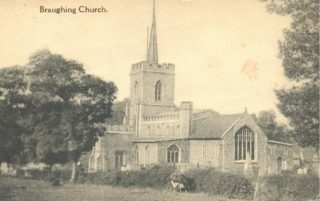 Have visited braughing and the church of st mary the virgin.